Certificate as awarded to Johnnie's following this nomination. ReneG is my hero. He takes public transportation everywhere, checking out every possible unknown restaurant in the greater Chicago area. He enlightens us about gems that few of us are not even remotely aware of. In the same light, I would like to enlighten the Greater LTH community to my choice for a GNR award. This hidden gem, tucked away on a quiet suburban street, took years of sifting, and filtering…sifting, and filtering to discover. Yes, my nomination is for the virtually unknown Johnnie’s Beef in Elmwood Park. But in all seriousness, I truly believe Johnnie’s encapsulates every element needed for nomination. Their beef sandwich has been " talked about ad infinitum" (edited to accommodate Mr Hammond's suggestion below) . It has taken on a monumental stature similar to Michael Jordan as far as Chicago beef stands go. Personally, I prefer making the 25-minute hike out to Elmwood Park for their Italian sausage sandwich with both their sweet and hot peppers. But this isn’t meant to insinuate that their beef is chopped liver or anything of the sort. It just means that Chickie’s has that top honor in my book by the smallest of margins. This is mostly due to their stellar giardinera made with razor-thin celery pieces. (What do you know? Chickie’s was initially discussed on LTH by, I believe, ReneG as well as Paul Mollica!). I also love Johnnie’s Italian ice since its sweetness isn’t over the top. This is basically Johnnie’s entire menu, which is another reason for its greatness. Places that offer only a hand full of items made precisely in the fashion that they desire aren’t found too often. What they do, they do extremely well. End of story. Focus. No frills. No nonsense. Just remember one thing, though; keep moving in line or the hungry mob with the anxious smile on their faces behind you might consider a lynching appropriate. Probably the most important reason for my nomination is that I sense Johnnie’s Beef is considered by its neighborhood to be an indispensable institution to the culinary fabric of their community. I’ve never been there at any hour of the day where the local (and others) ritual of a Johnnie run wasn’t accompanied with an excitement that rivaled something like entry to Wrigley Field (wait a sec…. make that U.S Cellular). This is an important neighborhood, or for that matter, Chicago landmark. I’m hoping that one or two of you out there have been to Johnnie’s and have it in your hearts to consider its nomination. Thank you. Last edited by PIGMON on November 25th, 2005, 8:52 pm, edited 3 times in total. While I am an Al's fan as you well know, your post has whetted my appetite to make a sojourn in the future. I heartily second this nomination. Funny approach you took in the opening paragraphs. Several years ago (was it really early 2002?! ), my very first post on Chowhound was an announcement that I had found this great Italian beef place, and I wondered if anyone else had tried it. The august Vital Information was the first to reply that, yes, Johnnie's was, in fact, a board favorite, and that I could find out more by simply searching a little way down the thread (at that point, it was just one long thread stretching back over two years). Might I suggest you emend “talked about ad neuseum" to" talked about ad infinitum"? And what took it so long! The greatness of Johnnie's became manifest to all on the 2nd Beefathon. We had just sampled some pretty good product at Carm's in Hillside, then hit Johnnie's for some calibration. Visually, the sandwiches look about identical, gray beef, oregano dotted gravy, a giardinara of chopped sport peppers with a few odds and ends. And taste, is so subjective. How can you just assert one thing tastes better. Yet, to a taster on that day, we all knew that Johnnie's tasted better. It is the best of the classsic Chicago beefs (so far, by a lot). It's only serious competition is Al's, which, in contrast, looks and is a different breed of beef sammy. Of course, Johnnie's grills stellar sausages on hard wood coals. Not only do these taste great and provide the excellent duo to the combo, they make Johnnies, on most days, the best smelling restaurant in Cook County. Yes, even better than a Barbara Ann's or a Khan's, the sizzle of those sausages on the real charcoal makes a scent for the Goddess. I am very fortunate to live very close to Johnnie's (perhaps one of the reasons we took our bungalow?). There are weeks I visit at least once. I have sampled enough Johnnies to know that there can be some clunkers. Bread a bit past its prime, sausages grilled only on one side, sammy's filled half-way. Yet, this gorgeous possibility of inconsistency is part of the charm too. It is still a stand. Still run without a business plan. On the other hand, Johnnie's has a staff trained with the precision of a Navy Seal team. My mother the sanitarian should appreciate the dedication they keep to wiping as they go along. This is a clean place. A place most deserving of a GNR. I love Johnnie's too - beef, hot peppers on the side, with an Italian ice which serves as both beverage and refreshing dessert. I only wish they wouldn't print "as seen on FoodTV" all over their cups and napkins. I find the Al's - on Taylor - almost inedible and the prices an insult. Mr. Beef only if I'm in the neighborhood. Johnnie's worth the trip from any point on the globe. “talked about ad neuseum" is probably more appropriate. My reaction to the recommendation is thumbs down for any special recognition (as far as it's beef sandwich goes). It's a place living on a past well-deserved reputation, that it no longer lives up to. Amen, Bill. I have lived near Johnnies for thirty years and have eaten the combo sandwich a zillion times. In the last few years though, the quality and size of the sandwiches have been on the decline, and my visits there have been few and far between. Last night, after reading the lastest praising of Johnnies, I thought I'd stop by, have a combo, and see if I have been wrong in my criticism of this vaunted place. I have not been wrong. The Johnnies I enjoyed for years is not the Johnnies of today-not by a longshot. My sandwich of last night consisted of a well done(as usual) piece of bland, almost off tasting sausage, with exactly two slices of beef. I was not particularly upset because this "finger sandwich" is what I have been getting a Johnnies since it was sold a few years ago. This is my first posting, and I am sorry if my first attempt offends anyone. But I remember when Johnnies was the premier beef stand in an area that boasted a lot of really great beef stands like Connies and Greco's just down North Avenue. Thanks to the LTH Beefathons, I have discovered some great new stops for combos, like Boston BBQ, Jays, Dukes and Chickies. These are my stops for beefs. Last night's stop at Johnnies was my last. Based on this thread, I made my first trip to Johnnie's this morning. I arrived at 11:05 to find a line of 7 people waiting outside to get in, the inside was already packed. I really liked my combo (juicy/hot). Good flavour on the sausage and the beef was not dry in the least. I definitely got more than two slices, maybe the presence of the owner had something to do with it? I'll be going back, it is not a super large sandwich but then again, it's half the price of the Big Sammiches at other places. I don't get to Johnnie's as often as I would like (it's an hour drive each way), but every time I've been there the food has been at least very good. My last visit was a few months ago and I found no deterioration. I happily support this nomination. If Al's (which is not to my taste at all) could receive a GNR award, then Johnnie's is surely deserving. I will add my voice to the choir of praise for Johnnie's. Pigmon remarked to me the other day that he was surprised that not too many of the people who participated in the Beefathons have chimed in on this nimination (Since then George R has spoken up). I'd say the reason for that is because this is such a slam dunk nomination, nothing more needs to be said. stevez wrote: I'd say the reason for that is because this is such a slam dunk nomination, nothing more needs to be said. I agree, seems a slam dunk to me as well. Or, actually, maybe more of a slam dipped. Please consider my voice added to the chorus of praise for Johnnie's. stevez wrote: I will add my voice to the choir of praise for Johnnie's. Pigmon remarked to me the other day that he was surprised that not too many of the people who participated in the Beefathons have chimed in on this nimination (Since then George R has spoken up). I'd say the reason for that is because this is such a slam dunk nomination, nothing more needs to be said. Absolutely. People may argue that Al's is better on any given day, or that Mr. Beef is the best (yes, there are some who believe that), but no one to my knowledge has ever seriously presented the case that Johnnie's is not excellent. Newcomers to this site sometimes complain (and not without justification) that there seem to be some sacred places that the board accepts as indisputably the finest of their kind. They're right; Johnnie's is one of them. Mike G wrote: Uh, actually Dave, there are a couple of contrary comments right above you. I refer you to VI's "gorgeous inconsistency" clause, above. Pigmon hit the nail on the head when he said Johnnie's does a few things very well. Not many beef stands can come close to Johnnie's in either beef or sausage, putting their combo in a class by itself. Interestingly most Al's fans will will allow that Johnnie's is pretty good, whereas a number who like Johnnie's don't care for Al's at all. Apparently, the appeal of Al's style of beef sandwich is narrower but very intense. This doesn't mean one or the other is better, just that they are different. Both Bill and thick said Johnnie's has declined from it's glory days. If so, it must have been truly awesome and I deeply regret not having known about it in decades past. Having completed 5 beefathons to sample in semi-disciplined way the Italian Beef sandwiches of what is now well over 30 places, I heartily second this nomination. In the spirit of this investigation, I also am curious what places thick & bill enjoy, so I can figure out where this places are that make Johnnies look so mediocre. As to Johnnies, while I think the sandwich at Al's often comes together into something special, greater than the sum of its parts, and I am mightily fond of Chickie's, Johnnies beef has a depth of beef flavor and richness that I have not experienced elsewhere when it is on, and it is pretty good even when it is not at its peak. Now, Bill & Thick ,forgive me if you have already done this, but come clean and tell me which places you find to be the best Beef. Always looking for more to consider. (And yes, George, I will do Beefathon 5 ratings one of these days, just very busy, I guess). I shall add my voice to the heavenly choir praising Johnnie's beef, which is without question an excellent example of the type. However, I will also observe that I don't particularly care for Johnnie's, at least compared to some of my Italian beef favorites. I think part of the problem is personal, in that I have never been a big fan of Italian beef, and so to the extent Johnnie's represents the non plus ultra of the type, I may actually appreciate it less than some of the non-standard versions I really do like (e.g., Bombacigno's and the real dark horse candidate, Cafe Florian on 57th Street). What can I say? Maybe I am a bad or unqualified critic for this category. stevez wrote: II'd say the reason for that is because this is such a slam dunk nomination, nothing more needs to be said. I've never been on a Beefathon. However, I really like Boston's and Chickies, hell, I might have been te first to mention them (only if Rene was away from his computer). Boston's and Chickies are no Johnny's, though. They are all three seriously old-school, probably the most so. I'd like to see them all get a GNR, but for Johnny's not to get one would be like Jim Brown not making it into the Hall of Fame, on the second year (!). Went here after the Bears game last night. We arrived at 11:45. The beef is better, IMHO, than any other place in the area. I had the combo, Lauren had the Beef; both of us ordered them juicy and hot. I will admit to being a tad inebriated, but the intense flavors and heartwarming fare really hit the spot. We also had an Italian ice to wash down the beef. Even on a subarctic night, the ice was delicious. I heartily endorse Johnnie's as a GNR. The onions say "AAAHHH EEEESSE"
"This is undoubtedly the best Italian Beef I've ever had. Johnnie's is a triangular, retro-like roadside stand with a few outdoor tables--but its amazingly sweet beef has the kind of stickiness to it, is the most intrinsically juicy (it's not just the gravy that's wet, it's the beef itself! ), and comes on a slightly yellow roll that has a little more texture to it than most, holding the double-dip even better (make sure to ask for the double-dip). These are subtle things-but the effect on the whole is readily visible." Johnnie's gets posted about regularly, but not really reviewed since there is never much to add. There are two camps - the Johnnie's devotees (count me as one) and the Johnnie's debunkers who mostly say something like "It is way too expensive, has gone downhill and I like XXXX much better." To them I say this - even if you are right Johnnie's clearly remains the gold standard against which XXXX and all other places are compared. It also is the place you must visit if you want to explore Italian Beef. Okay enough for the Johnnie's haters. Really this place makes one of the best sandwiches you can find anywhere, of any type. Period. And they may have upped prices, but they have also done a truly admirable job maintaining a high level of quality, keeping focused, for years and despite great success and opportunity. Dmnkly wrote: Not that Johnnie's needs any support for renewal, but I think this thread pretty much illustrates the degree to which Johnnie's is burned into the collective LTH consciousness. I confess that though I've lived within a couple of miles of Johnnie's since 1979, I had my first in the last month. I'd eaten Italian beef a few times since I'd moved to Chicago and concluded that, unlike the Chicago hot dog, which had me immediately, I just didn't get it. I'd read all about how to order it, and I was trying it at moderately credible places, like Buena Beef and Portillo's, but there was just nothing there. 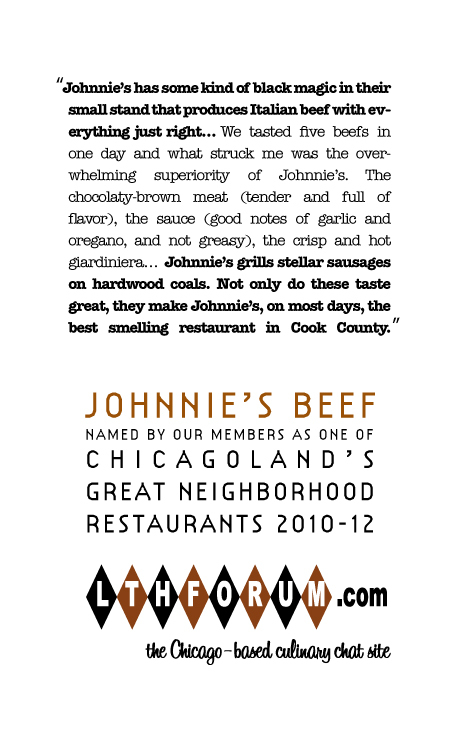 It turns out, to the surprise of few Johnnie's fans, I'm sure, that I'd just never had the right Italian beef. A Johnnie's beef is indeed a sublime sandwich, well worth my almost 30 year wait. I obviously cannot claim any expertise in the universe of Italian beef, but I can certainly attest that this is one hell of a great restaurant in my neighborhood. I started going to Johnnies before I even knew what a GNR, or LTH was. The beef sandwich with extra, extra giardinera is the route I go on my visits, and I typically eat two, either leaning over the front counter, or at one of the picnic tables. I've loved Johnnie's since the first time I had their beef, circa 10 years ago. Most other beef places pale in comparison. I know the GNR is only for Johnnie's Elmwood Park location, but the one time I was at their Arlington Heights Place the IB was up to the same high standard. A true winner, regardless of location. Wouldn't this be the best time to include Johnnie's second location in Arlington Heights? Cathy2 wrote: Wouldn't this be the best time to include Johnnie's second location in Arlington Heights? As valued as George R's opinion on all things Italian Beef one data point on the Arlington Heights Johnnie's does not a tag along GNR make. I'd also be interested to know if the AH branch is a franchise.